Dorothy lawrence - The only english woman soldier. 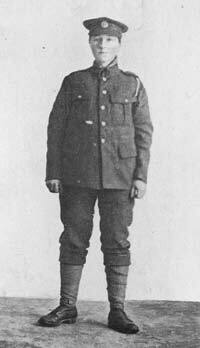 Dorothy Lawrence disguised herself as a man in order to experience life on the front lines. In the summer of France 1915, an aspiring Dorothy Lawrence dreamt of showing the world that she could be an investigative journalist. She cycled through the French countryside where editors told her that she had no hope of becoming a war-correspondent. Dorothy persevered and decided to prove them wrong. Supplied with her second hand jacket, badge, cap, puttees, shirt and boots; Dorothy learnt how to look like a soldier. She bound her breasts and used cotton and sacks to make her shoulders look bulkier. Dorothy gave her pale skin a tan with watered down furniture polish, cut her long hair short and learnt how to drill and to march. She forged military identity papers, calling herself Private Denis Smith of the 1st Battalion Leicestershire Regiment. Clothed in an old coat and wearing no underwear so soldiers wouldn’t find her abandoned undergarments, she cycled to Somme. Her uniform dangled behind her bike while her furniture tan dripped down her face. She made her way to the French and English soldiers while trying to look unattractive to avoid being approached. Dorothy met sapper Tom Dunn, a former coalminer; he helped her set up ‘private barracks’. Her cottage wasn’t very homey, with a soggy mattress and many biting insects. Tom shared his own rations with Dorothy until he could sneak her into the trenches. Dorothy worked alongside Tom, only 400 yards away from the German trenches. They laid mines in no man’s land under fire from shrapnel, rifles and shells. After ten days Dorothy started having fainting fits so she turned herself in so her friends didn’t get in trouble if she was discovered. Military authorities were embarrassed that a girl had been able to infiltrate their army. They treated Dorothy well, though they were initially suspicious that Dorothy was a spy. The army tried to get information out of Dorothy, but they failed and placed her in a convent temporarily. Because the military were concerned other women would try to copy Dorothy, they made Dorothy swear not to write about her experience.